It may seem difficult to believe, but there really are cats that glow in the dark. Find out how and why geneticists are altering cat genes and the benefits such experimentation could provide in the future. Glow-in-the-dark cats might seem like something out of a futuristic science fiction show, but they are a reality, and they are here. In at least two separate laboratories, genetic scientists have manipulated the genes in cloned kittens to produce fluorescent felines. A group of Korean scientists created cats that glow red, while another group of scientists at the Audubon Nature Institute in New Orleans produced kittens that glowed green. The process used by both labs is quite similar. The scientists harvested cells from a donor female cat, and inserted a genetic code to produce fluorescent protein into those cells. This protein is similar to one that gives some fish the ability to glow. Next, these nuclei with the altered genetics were inserted into the female cat's eggs to create cloned embryos and were implanted back into the cat's uterus where they could gestate and eventually be delivered via C-section. As a result of this genetic experimentation, only the cat's skin has the ability to glow in the dark. So, the fluorescence is only readily apparent around the cat's face and mouth, although it can be seen on its paw pads and underbelly where the hair is sparser. 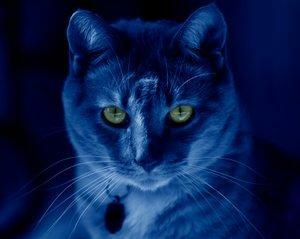 If the cat was shaved, the glow would be evident over the entire body when viewed under an ultraviolet light. Under normal lighting conditions, the cat looks just as normal as any other feline. The question begs; why would anyone want to create cats that glow in the dark? The answer is that these animals should prove invaluable to research regarding the role genetics play in a variety of diseases. Imagine if scientists could isolate the gene that causes cancer and remove it before that disease ever has a chance to develop. On the reverse side, what if scientists could insert a genetic code into a patient's DNA that would cure them? The possibilities definitely exist, but it will take additional research and experimentation to make these methods viable. Glow cats might just help further those goals. Here's the premise. Scientists can insert genetic codes, but it's difficult to tell if the implantation was successful. It usually takes a long time to tell if the desired results have been achieved. By adding the fluorescent protein, they had a quicker way to tell if the implantation was successful and that the cells would multiply in the cloned kittens. Scientists hope to build on this success and eventually implant more complicated codes to tackle a number of health issues in animals and humans. A further question might be why cats were used in experimentation that is ultimately designed to help humans? Animal testing for the benefit of humans is nothing new, but it's hoped that conditions are far more humane than they were in the past. As it turns out, cats actually have a similar genetic makeup to people, so they were a natural choice for trying out the technique. It should be noted that the fluorescent genetics are in no way harmful to the cats that received them. These animals are normal in every other respect. The glow cat produced by the Audubon Nature Institute, affectionately dubbed "Mr. Green Genes", was reported on by MSNBC.com and other news outlets. The cats produced in Korea can be viewed in this video produced by CNN. If the idea of owning a cat that glows in the dark appeals to you, don't get your hopes up any time soon. For now at least, these cats are simply valuable research animals that might one day contribute to a greater understanding of certain illnesses and that understanding might lead to cures for cancer, diabetes and more. Still, the idea of glow cats is intriguing. Just imagine being able to see your cat hiding under a bed or in the back of your closet. It could make some pet lover's lives with their cats just a touch easier.